August 1996 newsletter reported newly-organized DOC Running Club's early activities. Commissioner Jacobson accepts Roberto Clemente 10K first place team trophy from DOC Running Club president C.O. Iran Colon, left, and secretary C.O. Thomas McFall. Many having occasion to visit Central Office at 60 Hudson Street these days note immediately the golden runner crossing an invisible finish line overlooking the sixth floor reception room. It would be hard not to notice the figure frozen in the hands-up, chest-out, tape-breaking stride atop a three-foot high trophy that is perched on a high corner ledge above the security desk. The track award was placed on view there after Commissioner Michael P. Jacobson officially accepted it for formal display from Department of Correction Running Club officers. They explained that the trophy signifies the top honors that club runners earned as a team in the Roberto Clemente State Park 10 Kilometer (6.2 miles) on August 18th. The event in the Bronx park involved more than 500 participants from state and local government affiliated clubs as well as business corporation teams. It was the first time that the DOC Club members ran as a team. Previously, Correction runners entered individual races wearing DOC colors but never a group competition. 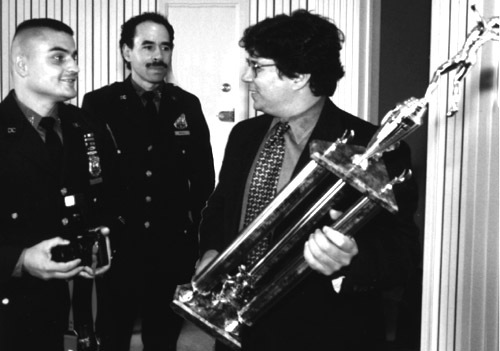 "To win first place anytime is impressive, but to win it the first time out as a team is truly an outstanding accomplishment," the Commissioner said as he accepted the trophy for display. "I congratulate club members." Among those who participated in the Clemente competition were COs James Simmon, West Facility; Karen Snyder, Capital Procurement; Iran Colon, Fire/Safety; and David Candelaria and Daniel Cordova, both BHPW. Club President Colon notes the DOC team, first organized last year, welcomes women and race-walkers, adding that C.O. Synder will be running in her first New York City marathon. Also ahead: some members plan a trip at their own expense to run in events in Puerto Rico. "We will carry DOC colors across the seas with honor," he declared. The first-place-finish-first-time-out was no fluke. Since then the team has won other races, including the city agencies' cross-country and the 104th Street Hope Community Run. 1997 and 1998 newsletters reported on DOC Running Club-sponsored 1st & 2nd 5-K Runs. Image above and caption below from Summer 1998 issue. Chief of Dept. 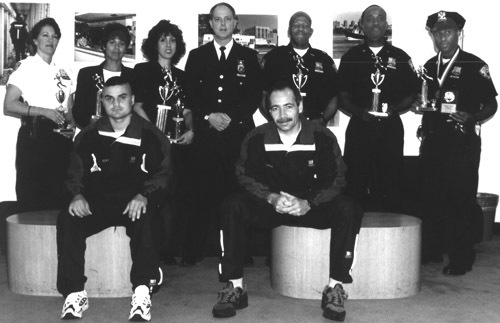 Reilly congratulates trophy winners for the fastest times by DOC runners in the 2nd annual Rikers 5K race in May. Female winners from left: Capt. Margaret Calvello, BkHDM, 2nd, 24:10; Investigator Maggie Figueroa, 3rd, 25:37; Helen Ciano, Financial Systems, 1st, 22:59. Male winners from right: CO Alan Mullings, MDC, 3rd, 20:37; CO Christopher Spears, Transport., 2nd, 20:28; CO Kevin Lynch, JATC, 1st, 20:16. Nearly 300 -- including non-DOCers -- ran. An equal number watched. Thomas Dion, a Jackson, Tenn., collegian, was the top winner overall at 15:52. Lillian Kroner of Queens placed first among females at 19:40. Sponsors included Fleet Bank, COBA, Blue Knight Police Awards, Fraternal Order of Police, Bulova Watch, and the NYC Parks Dept. Usually anyone caught making a run for it on Rikers winds up in shackles. On Saturday, May 3, about 150 bolted across the island's bridge but no one was put in irons. Some even received metals of another kind: trophies. For what is reported as “the first time ever,” the Francis R. Buono Memorial Bridge was part of the Rikers 5K Challenge Run. The 3.1-mile event started on the Queens side at 9 A.M. when Commissioner Jacobson gave the countdown after commending the runners' dedication in the face of steady rain and heavy winds. The finish line was in front of the GRVC. The DOC Running Club sponsored the foot race open to all DOC employees, city agency runners, running clubs, individuals and groups. Awards went to male and female runners in the various gender and age categories: the first three teams, the first male runner overall, the first female runner overall, and, among DOCers, the top males and top females also received awards. 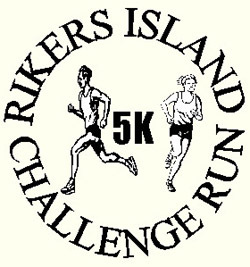 This NYCHS "look-back" marking the Rikers Romp's 25th anniversary is presented in conjunction with the DOC Running Club's 7th Annual Rikers Island Challenge Run May 1, 2004. ARDC CO Michael Crowe, DOC Running Club member, posted the best finishing time among correction competitors: 16 minutes and 19 seconds, just 15 seconds behind the overall first placer, Alan Wells, a local banker. CO Crowe also took top honors in the 30-39 male age category. Club civilian member, Anibal Rivera, brother to CIFM CO Victor Rivera, placed third overall with 16:50. He topped the 40-49 male category. Placing second among male DOCers was West Facility CO James Simmons (19:07); third was CO Samuel Martinez (19:25). Among female runners, non-DOCer Luann Mestre of the Hellgate Road Runners Club, came in first with 21:12. Among female employees, Range CO Margaret Calvello came in first with 24 minutes 19 seconds. She also was first in the 30-39 year female age category. ADW Jane Gibson, executive officer with Security Operations, placed second among female DOCers, having a time of 28:16. Among running clubs, the outcome was: Van Courtlant Track Club, first; Hellgate Road Runners, second; Los Comadres Runners, third. DOC Running Club president, Fire & Safety CO Iran Colon Colon, said that the 5 kilometer course was calibrated and certified by the A.P. Circuit Corp. To Part I of this 2-part presentation. (780Kb, 3 pages of JPG screen captures of Part II of 2-part web presentation).